THE BLOG SLOG: A PR’s guide to the brilliant, brutally honest and bonkers world of blogging! This week&#8217;s guest blogger is PR pro, mummy blogger and honorary Jammer, Eve Deasy. She gives us the inside scoop on tricks of the blogging trade and how PRs can make the most of valuable working relationships with them! As well as being a PR lady and honorary Jammer, I am also one of the UK’s many (many!) mummy bloggers. Blogging is something I dipped my toe into after having my first baby last year and, like many new mums, it has provided me with a platform to share my feelings and parenting stories with likeminded souls. I have found it to be a cathartic and rewarding process, and I have enjoyed telling the world about my mummy journey. I may be a blogging novice, but my foray into this world has opened my eyes to so many things. If, like me, you thought that blogging was just about writing a few posts and uploading them to a WordPress page, you’d be very wrong! 1. Bloggers are obsessed with numbers. For a blogger, numbers are very important indeed. As well as being crucial to provide to PR people and other interested parties, a blogger’s readership figures, bounce rate, unique visitors and social media stats are what make them tick. If your brand can help bloggers to build their existing audience and grow their numbers, they are more likely to be receptive to your ideas.&nbsp; Competitions work well. Don’t just send them stuff to try, if they like your product, send them some to give away to their readers. 2. Bloggers take blogging VERY seriously! For many bloggers, blogging has gone past the hobby stage. They have made friends in fellow bloggers, they attend and host blog clubs and meet-ups. They work on their blog every single day and pour out their hearts and minds to their readers. They have cultivated tribes. This is their livelihood. Even as a very occasional baby blogger, I have learned so much about social media and how to drive traffic to my blog from the different platforms. I have learned how to use WordPress (which can be used to build websites), I have taken part in linkys. I have read articles on how to attract blog traffic from Pinterest and Instagram. I have joined in with blogging debates and branded Twitter chats. I have used and mastered apps such as Rafflecopter, Wordswag, Cavna, Social Oomph, PicMonkey and Hootsuite. The big hitter-bloggers are incredibly knowledgeable about utilising social media and SEO to grow their numbers, increase their followers and engage new audiences. They know what time of day works best for engagement. They know the worth of a well-placed Twitter picture or a funny video. They know how to re-hash their evergreen content for maximum results. Bear this in mind. They can probably teach you a thing or two! A blogger may have 3,000 Twitter followers, 1,000 Facebook fans and a handful of Instagram users, and to an old-fashioned PR, this might seem small fry compared to the huge readership (and AVE) figures of the nationals and consumer magazines – but, and here’s the big but – blogger audiences are hugely engaged. Blogging and blog-reading is a two-way thing, and many readers have developed almost personal relationships with their blogging heroes. Bloggers READ their social media comments. They write back. They chat. They exchange advice. They ask for advice. And the readers love it. Don’t underestimate a blog’s audience – they may be small in number but they make up for it in unrivalled loyalty and enthusiasm. As well as writing amusing anecdotes and how-to guides, bloggers tell their readers about their bad days, about their fears and their worries. They share their actual LIVES with their followers, and because of this, bloggers are TRUSTED. And, as every PR person understands well, gaining trust is hugely important.&nbsp; Bloggers are not faceless strangers to their readers, they are friends. Their opinions matter. And because of this, these opinions are like gold dust. The world of blogging has been around for some time now, and bloggers that have built up substantial followings know how important they are. They know that brands WANT to work with them, and they are no longer prepared to print your press release word for word on their popular blog for nothing in return. Although many bloggers, including myself, have written honest reviews for newly-launched companies in exchange for a few freebies, if you want to work with a blogger, do your homework. Don’t adopt a scattergun approach. Read the blogs. Get a feel for the blogger and what’s important to them. Cherry-pick some brand ambassadors that you feel reflect the values of your brand the best, and treat them well. Bloggers know very well that their readers demand unfailing, brutal honesty, and they always deliver! If you do send a product to a blogger, or develop a professional relationship with them, you can be absolutely sure that their opinions and reviews about your gear or service will be refreshingly frank. This might seem slightly scary to a PR person who is charged with generating positive press coverage, but if your product delivers and a blogger gives you the thumbs up, this is a very good thing. It is also worth remembering that many bloggers have gone on to write for outlets such as the HuffPost. So keep an eye out for that incredible writer who’s posts make you cry or belly laugh – blogger followings can go from zero to hero overnight with one amazing article. As experts in social media management and digital PR, we love to keep abreast of all the latest technology trends, so here we take a look at some of the latest developments in technology to hit the headlines. We’re excited about both of these as you can become an at-scene reporter on anything that takes your fancy, or you can tune in to see what fellow streamers are streaming. Periscope and Meerkat are live video streaming apps which link to Twitter so you can watch live video footage from anywhere in the world from your phone, iOS device or computer. While Periscope is owned by Twitter, Meerkat is an independent rival and although both offer the same service, there are subtle differences in functionality between the two. Of course, celebrities have got on board, with Jamie Oliver, David Blaine, Ringo Starr preferring Periscope, and Jimmy Fallon, Rio Ferdinand and Madonna masquerading on Meerkat, while Arnold Schwarzenegger straddles both just to be diplomatic. There are some brilliant broadcasts of glacier tours, tropical sunsets, backstage at TV shows and movie premieres…but for every interesting or critical event, there are posts of chopping up of salad, the insides of people’s fridges, performing pets and drunken karaoke performances. Still, it’s quite addictive, funny and shows you scenes you would not normally see. Look out for live streams from us and our clients coming soon! Yes, everyone listens to their music streamed on Spotify now, but music mogul Jay-Z is trying to support his fellow (multi-gazillionaire) singers by launching a brand new way to sell and listen to music, with his own streaming service, Tidal. But oh, how it has backfired. Despite much celebrity support (mainly from Jay-Z’s industry pals), it seems to be lacking fans among the public compared to stalwart Spotify, prompting front man, Mr Z, to perform a freestyle rap, targeting the corporates he thinks are against his scheme, specifically Spotify, Google, YouTube, Steve Jobs. Tidal is more expensive than Spotify, but Tidal promises to ‘deepen the connection between musicians and their fans’. Musicians involved so far include the likes of Madonna, Rihanna, Usher, as well as some artists who go by two names….Alicia Keys, Kanye West, Nicki Minaj. Brit-side, Coldplay are flying the Tidal flag but we can’t see many other British artists on there as yet. The social media launch activity included the hashtag #TidalforALL which also received a barrage of abuse, including the rebel hashtag #TidalforNOONE as people protested at its ethics. Then, away from the limelight is Yusic (iOS YouTube music app), the same music and audio streaming service but for free! It was updated earlier this year to include new features based on user feedback and is certainly the underdog in this highly competitive marketplace. For now, we’ll stick to Spotify, or even the good old wireless, but we’re sure Jay-Z will get by with a little help from his friends. Let us know your opinions and preferences on Periscope vs Meercat, and how you prefer to listen to music. Join in the debate via our Twitter and Facebook pages. After what seems like a lifetime, Election Day is finally upon us and it is proving to be one hell of a battle, with every man and his dog getting involved. But the one demographic that has been receiving more attention than any other by all the parties, as well as the media, is the ‘millennials’ – in other words, those in their teens and twenties. They are often portrayed as the generation that couldn’t care less about politics or, at the very least, don’t feel like anything the government does benefits them. In fact here at JAMpr we did election research for our client, leading telematics based insurance provider, Carrot Insurance, which revealed that young motorists felt disheartened by all the political parties and 26 per cent did not even intend to vote. Therefore it has been the mission of those involved in the lead up to the election to connect with the younger population and get them voting, whatever it takes. Social media has transformed the way we interact with those in the spotlight and political parties are no different, allowing the public to give instant feedback on new policies, interviews or even what party leaders eat (Ed Miliband’s bacon sarnie-gate anyone?). So it’s no surprise that Twitter introduced official hashtags. 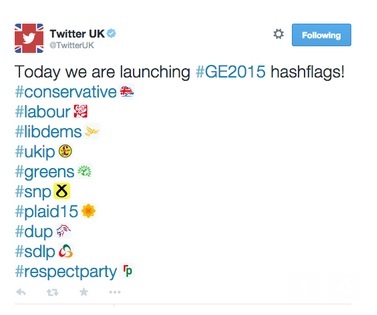 Tweets containing #Conservative; #Labour; #LibDems; #UKIP; #Greens; #snp; #Plaid15; #DUP; #SDLP or #RespectParty all feature party badges now – a great way to make the tech savvy youth feel like they are part of the conversation. 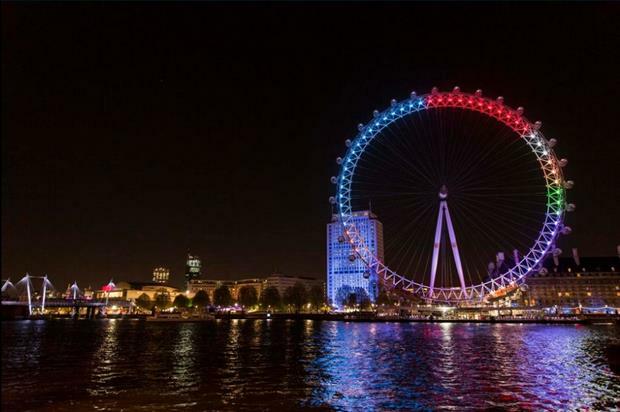 Not to be outdone by its rival, on Friday 1st May, Facebook lit up the London Eye as a pie chart to represent the main political parties discussed on the site, while Saturday and Sunday showcased the parties discussed by men and women respectively. 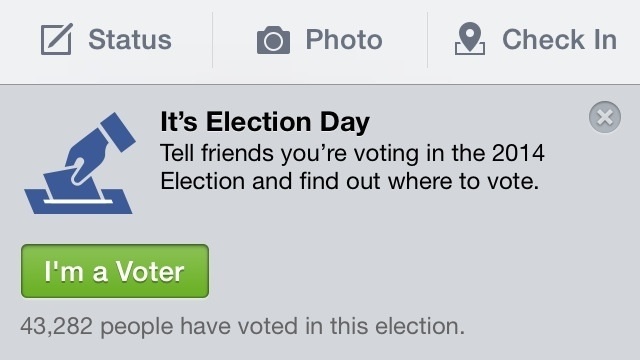 On Election Day itself avid Facebookers will have spotted the message letting them announce to all their friends ‘I’m a voter’ – a sure fire way to guilt people into taking part! Unsurprisingly, all the major party leaders have been interviewed none stop over the past few weeks. Surprisingly, this time around it wasn’t just restricted to newspapers and Question Time, but rather a whole new audience of potential voters. 2015 marked the year where Heat magazine interviewed Prime Minister David Cameron, The Last Leg was paid a visit by Deputy Prime Minister Nick Clegg and even Russell Brand got chatty with Ed Miliband. For good or for bad it certainly got people’s attention. It may not have been the most successful of the lot, but The Green Party certainly made a valiant attempt to appeal to the twenty some-things burned by the Lib Dems in 2010, releasing a boy band video as a political broadcast encouraging voters to “change the tune”. It may have been cringey and left you feeling a bit embarrassed for the party but it definitely made an impact (at time of writing it has had an impressive 860,084 views on YouTube). Maybe one of the most simple but ingenious PR stunts was digital channel, and favourite with students and twenty-odd year olds across the country, E4’s announcement that they would be off-air from 7am-7pm on Election Day in a bid to get viewers down the polling station instead of watching American repeats. Whether these new tactics have the desired effect we will have to wait and see for the results, but either way it has certainly made the election a lot more interesting!